Modern Vespa : FAQ: How can I avoid overflowing the gas tank? FAQ: How can I avoid overflowing the gas tank? The gas fill design on modern Vespas is notorious for overflowing when filling up. This usually results in gasoline getting into the underseat bucket, all over the paint, the exhaust, and (worse) you. 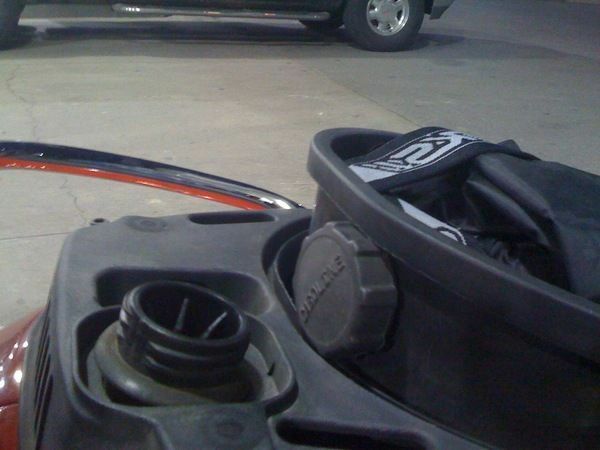 The solution is to hold the nozzle so that it is directly over the underseat bucket, aiming toward the back of the bike. 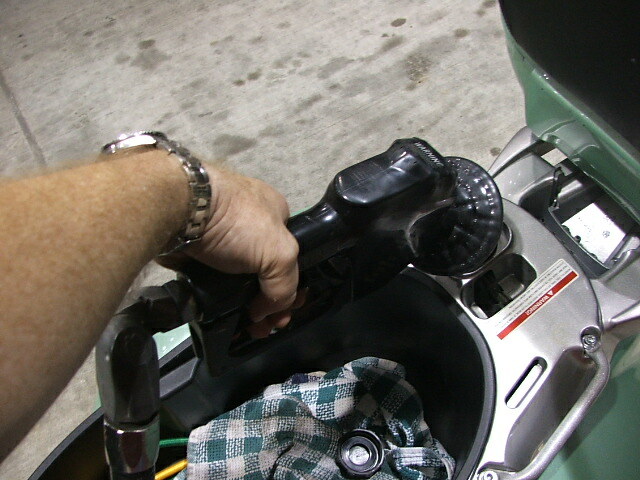 Be sure to put the nozzle as far in as it will go, and fill slowly until the gas clicks off. Do Not attempt to top off the tank. As a safety measure, you can remove the bucket from the bike before filling up. This ensures that even if gas overflows, it won't soak everything in the bucket. For your MP3 riders, the technique is slightly different. Pull back the recovery hose (if your state has them), position the nozzle at a 90 degree angle to the bike, push the nozzle as far into the tank as it will go, let loose of the recovery hose and pump slowly until the gas clicks off. Note that this solution isn't 100% guaranteed to prevent overflows, but it will greatly reduce them. There additional measures one can take to ensure that gas will not spill into the underseat bucket on models where the bucket is removable. The oldest and most obvious solution is to take the bucket out and place it sideways across the opening while fueling up. Other solution is the Q-Maneuver, which can be done simply by propping up the back end of the underseat bucket with the gas cap, as pictured.